Darren Lehmann, the Australia coach during the infamous ball-tampering scandal, feels then captain Steve Smith shouldn't have turned a "blind eye" to the ill-fated plan in Cape Town. Lehmann stepped down as coach after Smith and his deputy David Warner were handed one-year bans by Cricket Australia in exemplary punishment for their role in the scandal in March that shook the game. 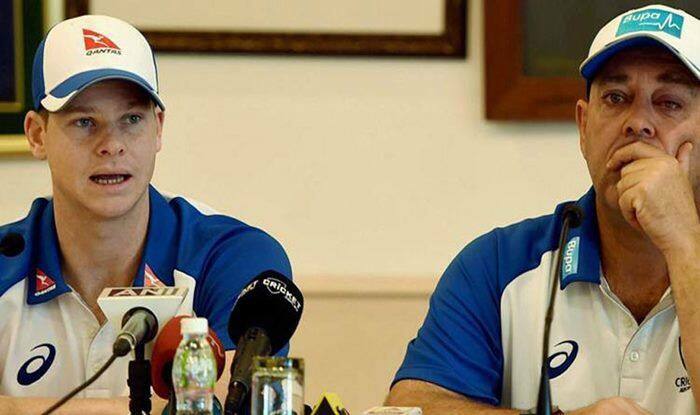 Darren Lehmann, the Australia coach during the infamous ball-tampering scandal, feels then captain Steve Smith shouldn’t have turned a “blind eye” to the ill-fated plan in Cape Town. Lehmann stepped down as coach after Smith and his deputy David Warner were handed one-year bans by Cricket Australia in exemplary punishment for their role in the scandal in March that shook the game. Cameron Bancroft, who actually committed the offence, was banned for nine months. His ban ends on Saturday, while Smith and Warner will have to wait until March. “Steve decided to turn a blind eye. He was captain of the country and he should have more control of that,” Lehmann told ‘Macquarie Sports Radio’. “I still can’t understand the pressures of captaining your country, it’s quite high you would think,” Lehmann said Bancroft should have approached the support staff when he was asked to tamper the ball. “Yeah, he (Bancroft) could have and should have come to us,” he said. “A severe mistake made by the guys and a lot of people have suffered one way or the other through that. We know it should not have happened, but it did. You’re sitting up there in the dressing rooms seeing what’s happening and your heart sinks. “For me, I think we need to move on and understand it happened and it was a really bad time in Australia cricket,” said Lehmann who played 27 Tests for Australia between 1998 and 2004. On Wednesday, Bancroft said Warner asked him to use sandpaper to alter the ball and claimed he went along with it to “fit in” and feel “valued” in the team”. Warner, who has taken responsibility for his part in the incident, is yet to respond to the latest revelations. Former Australian wicketkeeper Adam Gilchrist, who conducted the interviews with Bancroft and Smith for Fox Sports, encouraged Warner to give his side of the story for the sake of his future international career. “There’s no doubt Davey Warner would be feeling so isolated at the moment,” said Gilchrist. “I would encourage Dave to come out wherever and just be honest and as open as you need to be to get back to playing cricket.” Former opener Michael Slater said Smith and Bancroft were attempting to “bury” Warner and it would be difficult for him to return to the team. “There is a strategy behind Steve Smith and Bancroft, and Dave Warner’s off the radar at the moment,” Slater said. “In terms of a respectful comment on Dave Warner, there’s been none of that. So to me, it is untenable, they’ve buried him very quickly,” Slater, who is currently commentating for Seven Network, said.